My partner Helen captured this on her phone in a lift in Coventry station. The sign in the middle says "Riding of Cycles Prohibited". Cyclists here in the UK are used to encountering "No Cycling" signs everywhere, but this really takes the biscuit. 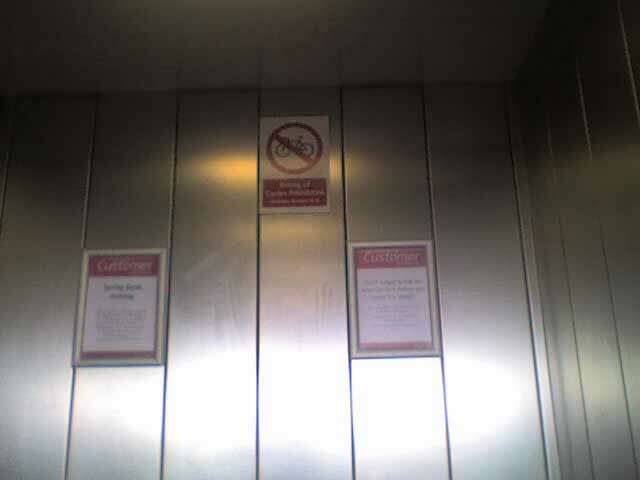 If you are not allowed to cycle in a lift, where are you allowed to??! It reminds me of the developers of the Brent Cross Cricklewood Development who, in early discussions with Brent Cyclists and others, proposed the idea of a cycle route through their site that would be linked to the road (the A5) via a lift. The general ridicule which ensued from this cased them to back down and propose a spiral ramp (another poor solution). But that they could even conceive of such a thing shows how unbelievably far from understanding utility cycling many of the most powerful people in Britain are. Then this also puts me in mind of Boris Johnson's ludicrous Thames cablecar project, that, unbelievably, looks as if it might really be built (I'll believe it when I see it). This has been well-critiqued here. Boris finds it too difficult to get the tubes to work well (they operated without problems on all lines for only one day last year), or to build cycle highways that bear the slightest relation to that name or are of the slightest use, but thinks it is a good idea to spend more money than it would take to fix these problems on a techno-folly on an epic scale that will do nothing for the basic transport needs of Londoners. Unfortunately it looks as though construction will be started this year, so it would be too late for Ken Livingstone to stop it, were he to be re-elected in 2012.